The Richard Sparrow House is a historic house at 42 Summer Street in Plymouth, Massachusetts and the oldest surviving house in Plymouth. The house was built around 1640 by Richard Sparrow, an English surveyor who arrived in Plymouth in 1636. 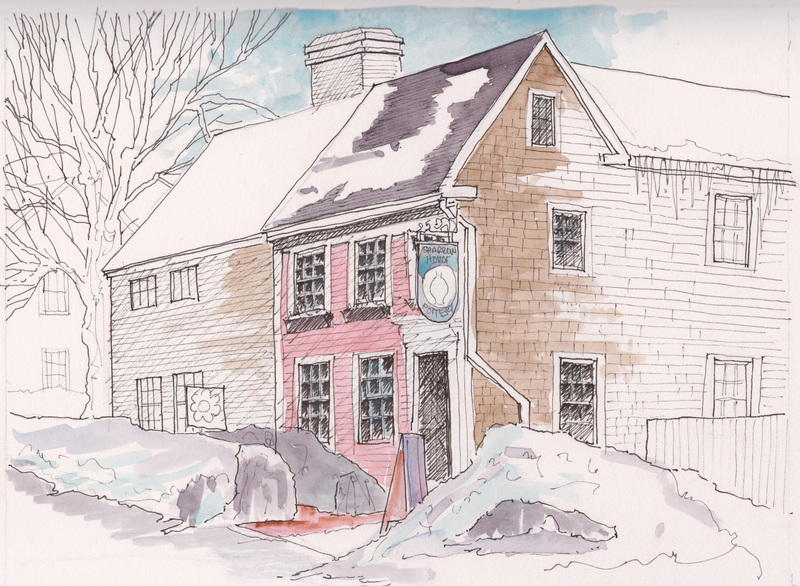 He was granted a 16-acre tract of land in 1636 on which the house was later built. 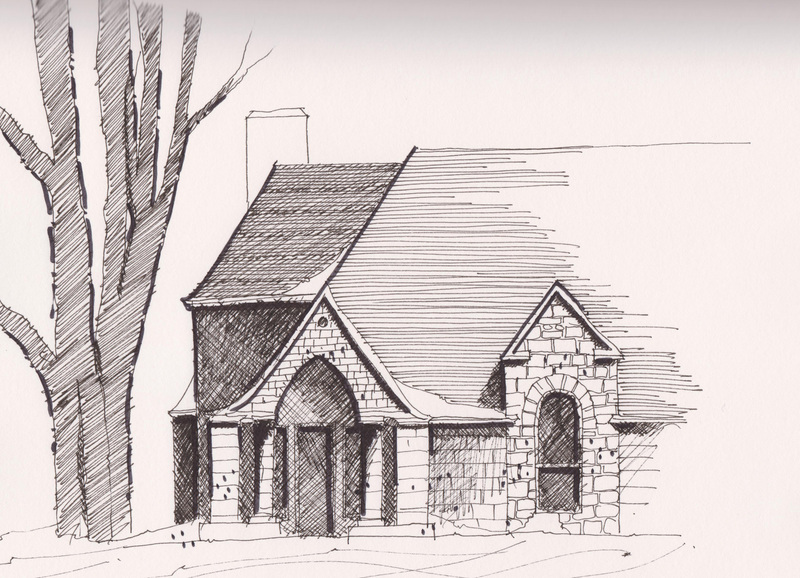 The Sparrow House is listed on the National Register of Historic Places in Massachusetts. The house is now operated as a house museum and the home of Sparrow House Pottery. 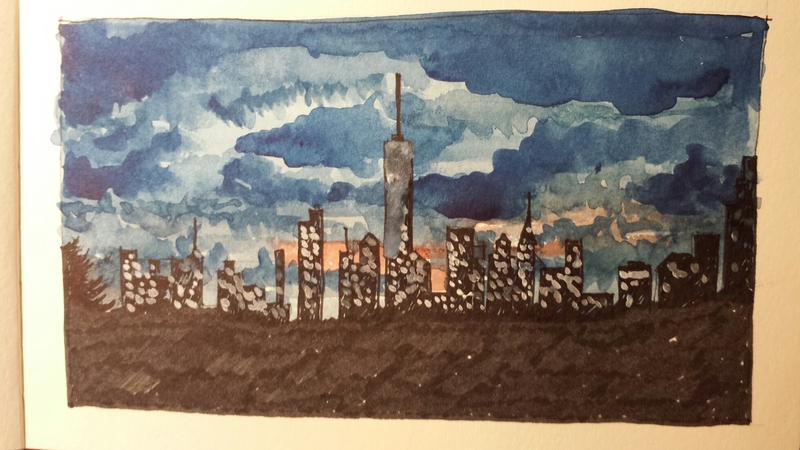 Pigma Micron Pens with Daniel Smith watercolors in a Stillman and Birn Alpha Series sketchbook. A great evening at the TD Bank Boston Garden to see the Boston Celtics play the Charlotte Hornets. 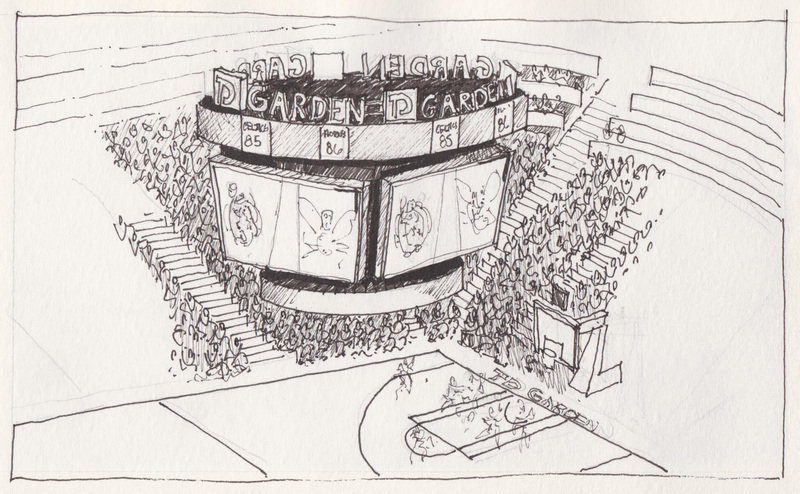 The game got very slow in the 3rd quarter so I sketched the scoreboard from our seats on the upper level. Celtics won the game in the end. Pigma Micron Pens in a Moleskine watercolor book. Might add a little color to this tomorrow. 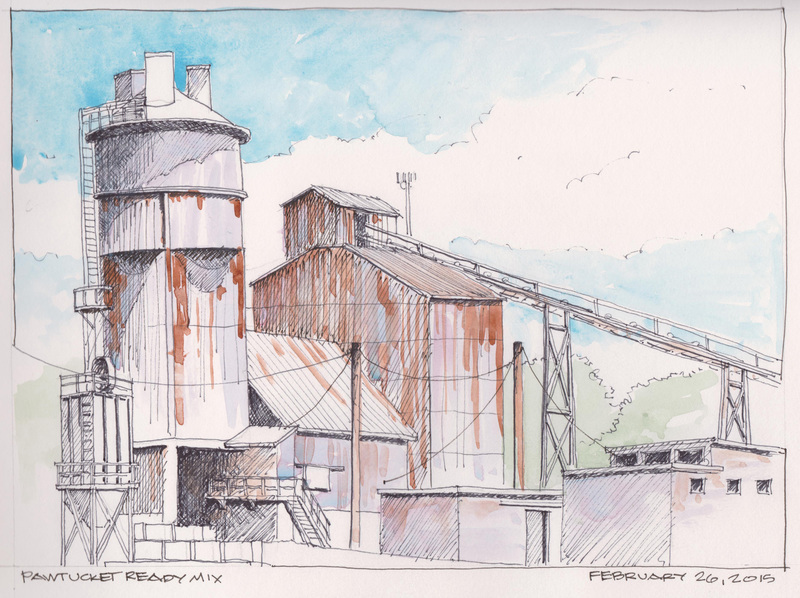 A co-worker in my office, Mark P., suggested that I sketch the old Ready Mix Plant just down the street from the office. It had been abandoned for some time and was a rusted hulk from an earlier time. When I drove by, it had been demolished and the site was vacant with the exception of the giant snow piles from this winter. Thankfully for Google Streets, I was able to get a street view photo of the facility before demolition. The photo shows a collection metal forms that had a wonderful rusted patina from years of use and neglect. Prismacolor Black pens and Daniel Smith watercolors in a Stillman and Birn Alpha Series sketchbook. Today I was struck by the contrast of this scene. I was at another project today at the Salem Country Club in the Ross Dining Room. 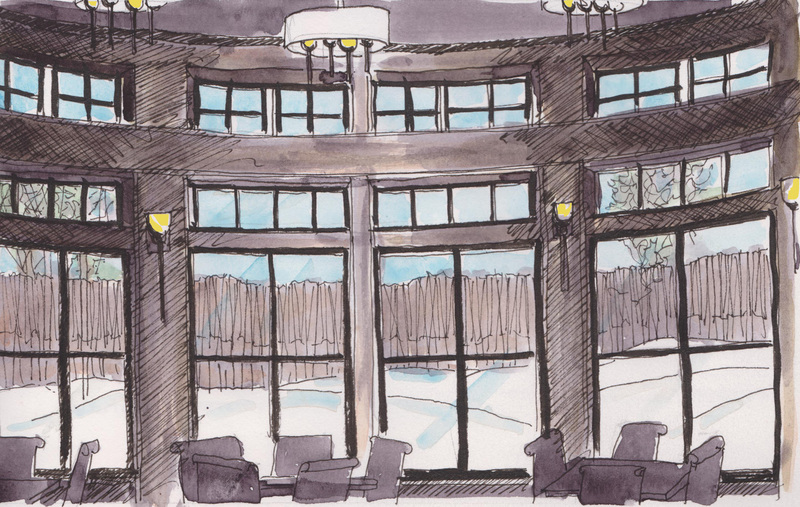 The brightness of the snow scene outside the windows contrasted with the almost black interiors as seen in silhouette. It was very difficult to capture some of the detail without going completely dark on the interiors. 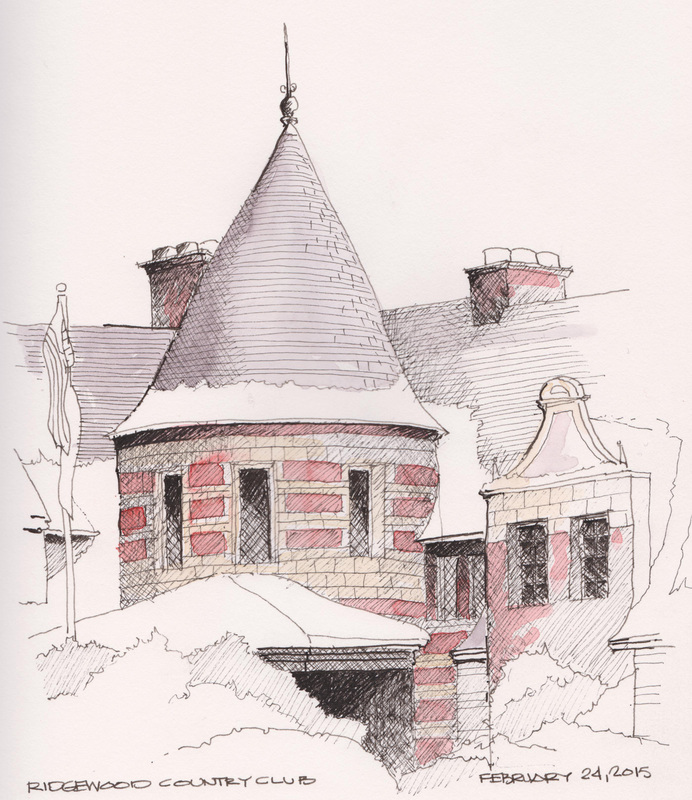 Faber-Castell pens with Daniel Smith watercolors in a Stillman and Birn Alpha Series sketchbook.